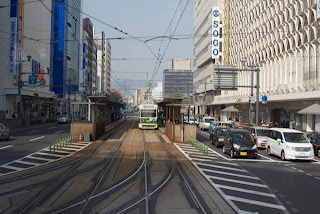 We arrived in Hiroshima at 7am this morning. Since we visited China in between Okinawa and Hiroshima, we had to go through Japanese immigration again. The immigration officials came on board with the pilot before we docked so they could start processing us early. The cruise director called us by tour number and floor to go into the theater, pick up our passports and immigration forms, have our photo and fingerprints taken again, and see an agent who checked our paperwork and stamped our passports. It took about 2.5 hours to process everyone and no one could go ashore until everyone had been stamped. After immigration we went back to our room to wait to be called a second time, to join our tour bus. 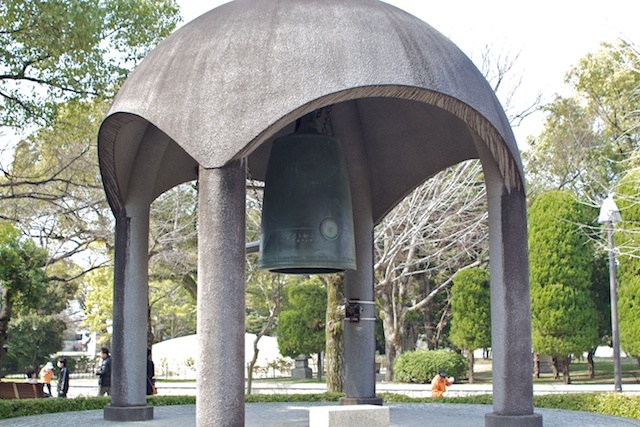 There were only 2 tours offered today "Highlights of Hiroshima" or "Miyajima." The second was to take a ferry to a nearby island with a famous shrine and shopping, so we chose the first one. We are glad we did. It was a good tour. Riding through the city there are streetcars everywhere. Our guide said they are like a streetcar museum, buying old cars from other countries. The first stop was at the Peace Memorial Park and Museum. 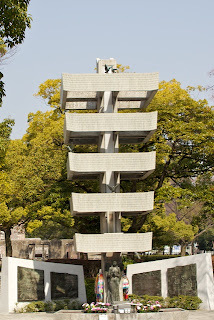 This is a beautiful park built near the epicenter of the atomic bomb strike. At one end you can see the remains of a building that was partially destroyed. At the other end is a museum documenting the effects of the bomb. In the middle between the two there is a flame that they say will continue burning until all nuclear weapons have been eliminated. The flame is at one end of a pool. 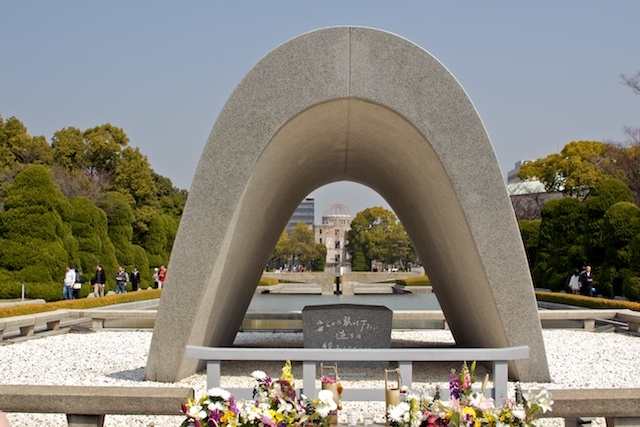 The other end has a concrete casket containing the names of all the people who died because of the atomic bomb. The park has a number of monuments that our guide took us to, mostly paid for by private group donations. One was dedicated to a little girl who died of leukemia at age 12 after being exposed to the atomic bomb as a 2 year old. Her classmates raised the money to build the memorial. Another monument was dedicated to schoolchildren who had been conscripted into service for the state near the end of the war because there was a labor shortage. Many of them were working outside in Hiroshima that day. The museum was heartbreaking to go through. Dioramas showed what Hiroshima looked like before and after the bombing. Both the immediate and long term effects on the people are documented and graphically shown. There are lots of photos and a few artifacts. 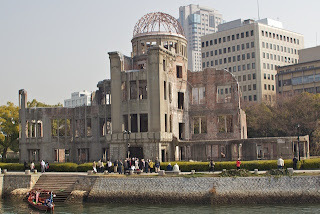 I asked our guide how long it took before the radiation levels were low enough to come into the city and she said that it was gone by the next day. The first day, the main problem was the heat. Everything was burning at such a hot temperature that it melted the teal girders in the buildings. After we left the museum we went to the Shukkeien Garden. This is a lovely garden around large Coy ponds. 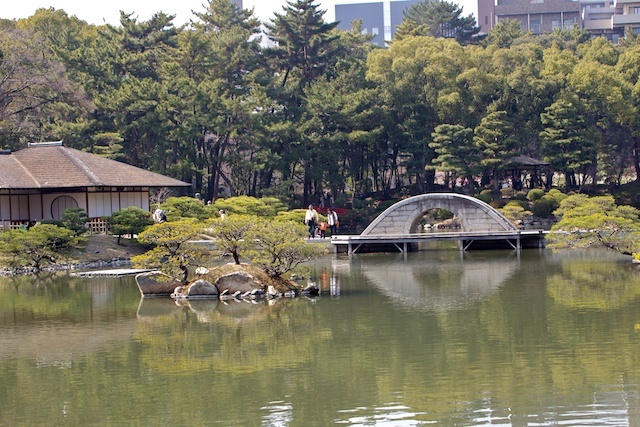 The garden was once part of the grounds of the Hiroshima Castle. The leading distributor of Coy fish donated 200 of them to this garden. It was a lovely, peaceful way to spend an hour. Near the end we had a pleasant surprise. A bride and groom were having their wedding photos taken in the garden and our guide asked them if they would mind if we took their picture too. 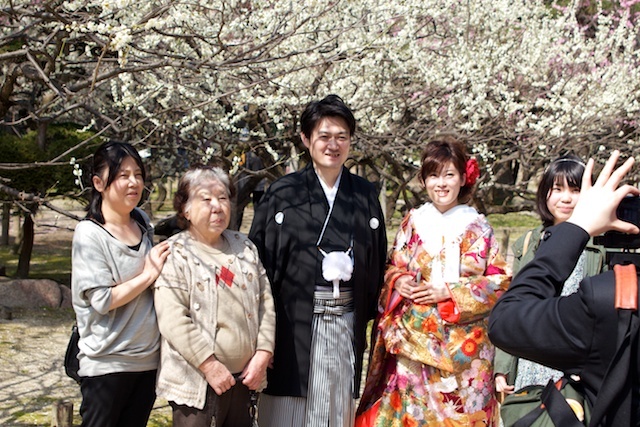 They consented and all the photographers in our tour group got photos of this nice couple in traditional Japanese wedding attire. What luck! Our guide gave us a paper folded crane as a parting gift. This is a traditional good luck symbol. Since all the tours left around the same time this morning, they all arrived back at the same time too. The result was a long line to get back on the ship. It took about 10 minutes to make it through the line. We had already invitation to attend a traditional Japanese Kagamawari ceremony at 1:45PM in the ship theater, but arrived on board after it had an begun. In this ceremony, a sake cask is broken with a mallet as a traditional acknowledgement of important guests. We stood in the back and arrived just in time to see the mallet being struck. At the end they distributed paper cups of the sake to anyone who wanted to taste it. I got a cup and gave Ray a taste. The ship left port about 2:30PM, so we have the afternoon to rest. We can sleep late tomorrow because we don't get to Osaka until afternoon.